London Mayor Boris Johnson wants the new Ultra Low Emission Zone (ULEZ) to be introduced by 2020. The Times newspaper says he will lobby the government to increase vehicle excise duty on diesel cars to encourage motorists to move to cleaner vehicles. Only diesel vehicles meeting the Euro 6 emissions standard will be exempt, while petrol cars registered before 2006 will also have to pay. "This has left us with a generation of dirty diesels." Many politicians argue that the root cause of London's poor air quality is Europe. EU attempts to improve diesel engines in cars have focused on reducing carbon dioxide, but emissions of nitrogen dioxide (NO2) weren't restricted. Many governments, not just in Britain, gave incentives to motorists to turn to diesel as a way of meeting EU climate change targets. So NO2 levels soared. Mayor Boris Johnson will give more details about his plans to curb emissions of nitrogen dioxide in a speech to mark 60 years since the first London-specific Clean Air Act was passed, stopping the burning of coal in some areas of the city. Campaigners now believe the mayor should take a note of the history and announce a complete ban on the dirtiest diesels. 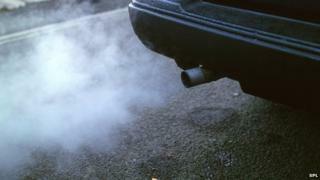 The RAC foundation has said incentives, such as putting diesel cars in lower vehicle excise duty bands, was to blame. Foundation director Professor Stephen Glaister said: "This isn't quite a mis-selling scandal, but for years ministers took their eye off the ball and encouraged drivers to buy diesels to help fight climate change. "That has come at a cost: local air pollution. Today 10 million cars in Britain are powered by diesel engines - a third of the total. "Part of the problem is regulation. In laboratory conditions diesel cars have met strict test criteria. Unfortunately that performance hasn't been matched on the road and now we have a significant health issue because of the dash for diesel." The initiatives are being considered to help meet European regulations on clean air and avoid the threat of heavy fines for breaching them. But AA president Edmund King said the vehicles with the most impact on air quality were buses, taxis and trucks. "Very few cars enter central London so these measures will have more effect on the growing numbers of small businesses and service vehicles on whom London's economy relies. "They will have to plan ahead to change their vehicles if they are to stay in business." Simon Birkett, from Clean Air in London, said: "In February last year Boris was planning to ban older diesel vehicles from the congestion charging area from 2020. "What he's now announcing is a backward step. It will be a charge for some diesel vehicles 10 years after a city like Berlin actually banned the oldest diesels. "It's like allowing rich people to pay ten quid a day to smoke cigars in pubs and schools." The Department for Environment, Food and Rural Affairs (Defra) said that unless action was taken, London, Birmingham and Leeds would face dangerous levels of pollution from vehicle exhausts by 2030. Government figures show long-term exposure to air pollution contributed to more than 28,000 deaths across the UK in 2010. And in February, it was reported that pollution near Buckingham Palace was the worst in the UK and almost four times the EU legal limit. Jenny Jones, from the Green Party on the London Assembly, told BBC London 94.9: "I back Boris on this but he is making a lot of promises that a future mayor will have to implement. "He should show some political bravery and bring the Ultra Low Emission Zone forward - what is he waiting for?" Will pollution warnings shift political policy?